The Wonderland Trail is a 93 mile loop hike around the base of Mount Rainier and contained entirely within Mount Rainier National Park. This strenous hike visits almost every major valley and ridge radiating from the mountain and is typically completed in 9-13 days. 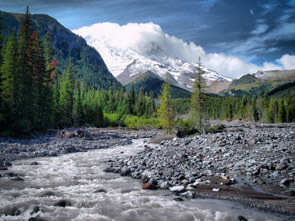 The Northern Loop is Mount Rainier's lesser known loop trail and extension of the Wonderland Trail. The trail itself is 15.5 miles in length, and returning via the Wonderland Trail makes this a 33 mile loop hike. 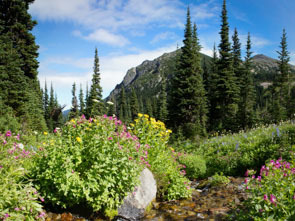 This trip be further extended with the Spray Park and Ipsut Pass (Wonderland Trail) to make a 48 mile hike that explores the best of the north end of Mount Rainier National Park. 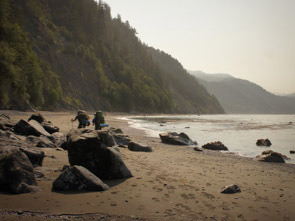 The Lost Coast Trail is a 25 mile beach hike along the most remote and rugged stretch of California coastline remaining. Pinned beneath the steep slopes of the King Range, several sections pass through intertidal zones and are innaccessible at high tide.